Many Karen refugees from camps along the Thai-Burma border have been resettled in Sweden since 2005 under the United Nations High Commissioner for Refugees (UNHCR)’s resettlement program. 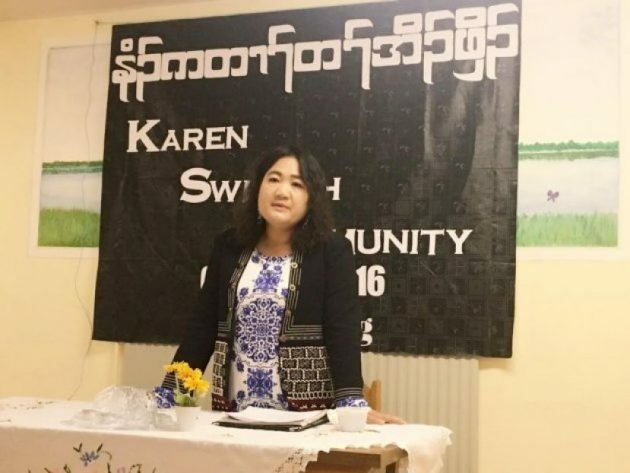 Karen News spoke* with Naw Thida Naing, chair of the Karen Swedish Community, at the end of July about the Karen community there and efforts to preserve Karen culture overseas. Q: Please tell us about the Karen Swedish Community. A: We established the Karen Swedish Community in 2005. There were only a few members, 20 or 30, back then. We weren’t able to organize well at first. Our aim is to preserve our Karen language and Karen traditions and customs like days of significance and Karen attire for the next generation. We also want to share our experiences and help each other after we arrived in Sweden, while not forgetting what our parents have faced. We don’t want our history to be forgotten in Sweden. We have organized this community to help ensure the Karen people do not face difficulties, depression or discrimination in Sweden. Q: How many members are in the Karen Swedish Community now? A: As far as we know, there are over 1,200 Karen people living in Sweden. We have over 600 members, including about 300 to 400 active members. There are 11 people on the executive committee. We also have women’s affairs, youth affairs, and education [committees]. These committees meet once a year. An election is held every two years. Q: When did the Karen people start settling in Sweden? How did they end up there? A: A few of them arrived at the end of 2004. The number [of Karen people] increased in 2005. The people who came in 2004 came under the IDP Resettlement Program…More Karen people came directly from the refugee camps under the resettlement program in 2005-2006. Q: What has it been like trying to preserve Karen culture, literature, traditions and customs over the last ten years, especially among the Karen youth in Sweden? A: There aren’t any problems with the youth, but the children who were born here and those who arrived at a young age have difficulty learning their own language and culture because they are very close to the local [Swedish] society. Youth around the age of 15 or 16 don’t have problems. They can understand the Karen language well. They can also read and write the language and they understand Karen culture. Children who arrived at the age of five or six don’t know how to speak in Karen. This is our first concern. The main responsibility of the KSC is to preserve the Karen language and culture. Up to 128 youth have graduated from high schools since we arrived here. This is something to be happy about. One or two youth have graduated from college. As far as we know, many Karen youth are attending college now. This will increase in the future. We expect the youth to work hard. We always urge them to study hard. Q: The Karen people mostly called land in the mountains and forests home in the past. What kind of difficulties have they faced after settling in a big country? A: Some adults struggle to learn a new language so it’s very difficult for them to enter Swedish society. Most of them only socialise within the Karen community, they don’t go anywhere else. Children and youth don’t have any problems. They can keep up [with the Swedish society]. We encourage the adults to learn, but in my opinion, the adults grew up in a culture very different from Swedish society. They have different views. As they don’t understand the language well, they can’t search for information. They don’t understand the laws so they are always afraid. This greatly affects their morale. The employment standards are mostly high in Sweden. They mostly want [to hire] educated people. Even if you want to work as a cleaning staff, you need to attend a training on how to clean a house. You must understand the language and pass the training. No matter what you do, you must pass the training. So there are difficulties when the adults can’t understand the language. Most of the adults are unemployed due to lack of experience and education. This greatly harms their morale. It’s very difficult for some of them. But when we look at the youth and children, they have great opportunities. They receive free healthcare, social welfare and education. It’s a very good situation for the youth and children. A: As I was a refugee, and came here under the resettlement program, I want to give [other refugees] this advice: No matter which country you go to through the resettlement program, the adults can’t catch up with the education sector. But we must have hope in our children and the next generation. We need to urge our children and grandchildren to study hard. We need to strive hard through improving our education. Don’t give up this hope. Our Karen people have been oppressed for many generations so we have many weaknesses. We need many educated people who can build the Karen State in the future. We must have hope in the youth and the next generation, their education can help them to assist and contribute to our country one day. We, the Karen people, shouldn’t forget our people. We must try to remember our people who are living in the country and help them as much as we can.